Castelmuzio includes three churches. 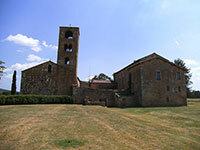 The most famous is the Pieve di Santo Stefano in Cennano, just outside the village. 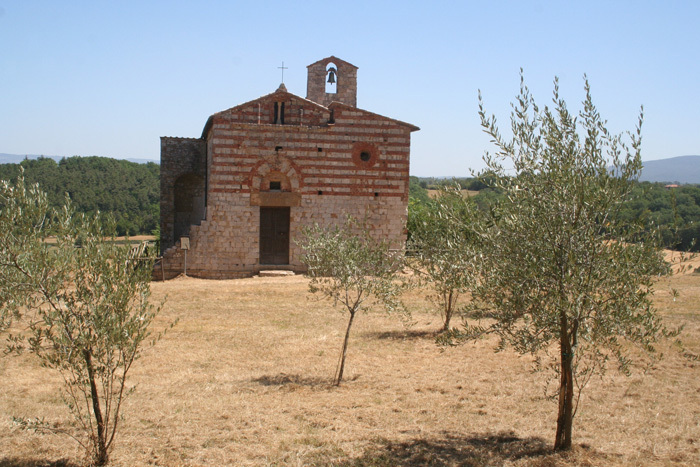 This small parish church has a documented history since 715 A.D. Its location was originally an Etruscan place of worship, and much later the church was built over an early Roman temple. The part you see today was built in 1285 A.D. In recent years a cemetery and Roman bath have been discovered very close to the church. The Pieve di San Stefano in Cennano, of paleo-Christian origin, arose around the center of what was a Roman settlement, a vicus. It was situated in an uncivilized area, a part of the greater municipality of Roman Arezzo. It was built on the foundations of a former pagan temple. 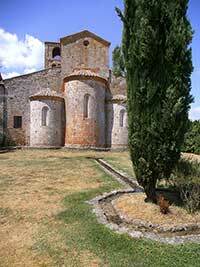 It is sited along an Etruscan-Roman road leading from Chiusi towards Chianti and Fiesole. The structure already existed in the 4th century, (perhaps consecrated by Saint Donato, second Bishop of Arezzo, who was an evangelizer in this area) as a baptismal church. As part of a group of 19 Pievi, it was the object of a famous dispute between the Bishops of Siena and Arezzo, over the question of to whom they belonged, which went on until 1220. Of the 19 ancient baptismal churches, Cennano and Corsignano are the only ones which have retained any integrity, while the others either no longer exist or have been radically altered. The present structure of the church, which is on the plan of a basilica with Romanesque traces, dates back to 1285, as a Gothic inscription in the arch above the door indicates. On the outside, in the doorway arch, in addition to the previously mentioned inscription, are some very interesting carvings, full of symbolic significance. At the sides are the figures of two human heads. Above those are two birds of prey (eagles), then two fleur-de-lis (French workers participated in the construction of the Pieve), topped by two mammals (sheep and bull), and finally, an eagle with its wings spread. To the side are two Maltese crosses, to symbolize the passage of the Knights Templar. Above the door in the front, is an arched window opening, with characteristic traces of the gothic style. 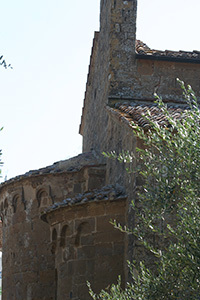 The Pieve di San Stefano is maintained by the Confraternita di San Bernardino. La Pieve di San Cresci, named after the saint and martyr Acrisius, popularly called Cresci, is situated just outside of Montefioralle, above the bustling town Greve in Chianti, in the province of Florence, in the diocese of Fiesole. The old church is named after one of the greatest evangelists of the Florentine countryside. La Macina di San Cresci , located in the pieve, consists of a studio space, gallery and residence for artists. It is a platform for creation, presentation and documentation of contemporary art in all its forms. 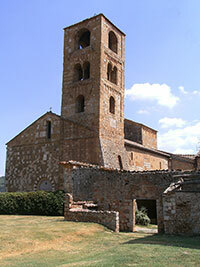 The Romanesque Pieve of San Pietro a Cedda is six kilometres from Poggibonsi's centre. It is an abbey-like building with a noteworthy apse and a large bell tower. The complex decoration of the portals and windows is also significant. The interior has a tabernacle attributed to Mino da Fiesole. It once housed also a 14th-century triptych of the Florentine School, now in the town museum of Colle. One of the most important monuments of Sovicille is the Pieve di San Giovanni Battista, or Pieve di Ponte allo Spino, a Romanesque church with nave and two aisles and adjacent the cloister's remains of Gothic's rectory. Located on the outskirts of Castiglioncello Bandini, in a hilly and unspoilt land, Podere Santa Pia is one of the best places to slow traveling in Tuscany. This formal cloister offers the quiet tranquility of a private retreat, with numerous attractions, beautiful nature reserves and beautiful beaches within easy reach.